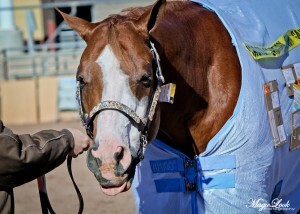 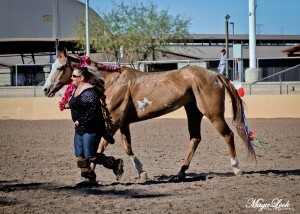 Photo courtesy of Magic Look Photography. 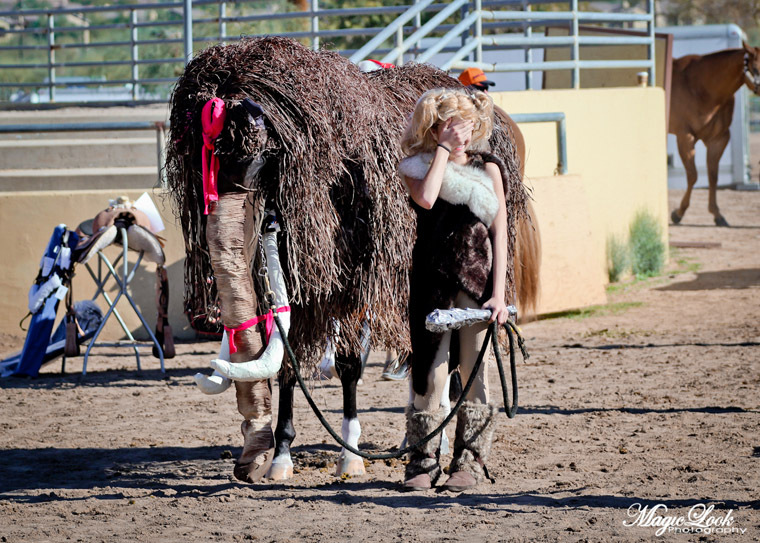 A woolly mammoth, an equine airplane, and a purple polka-dotted dinosaur aren’t the most typical competitors one expects to see in a showmanship class. 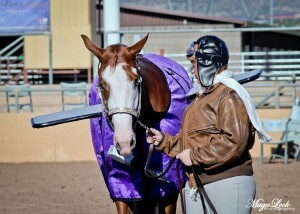 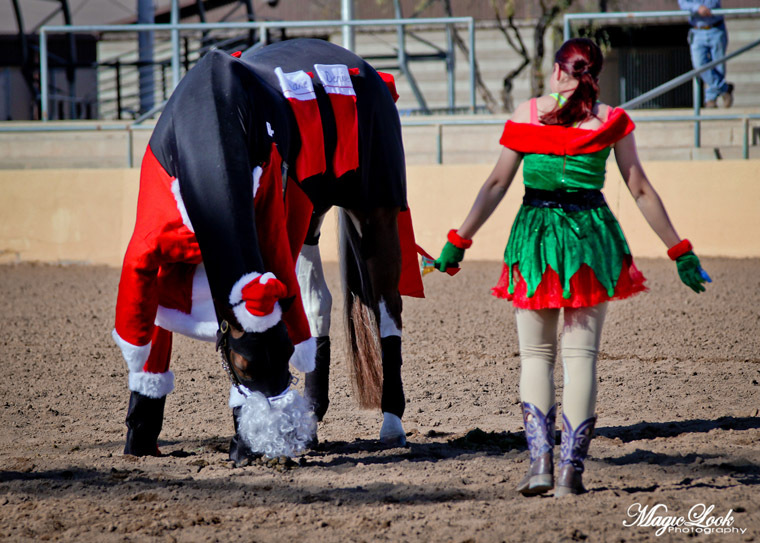 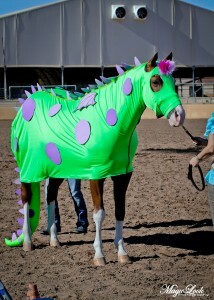 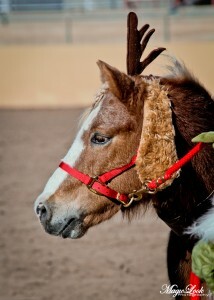 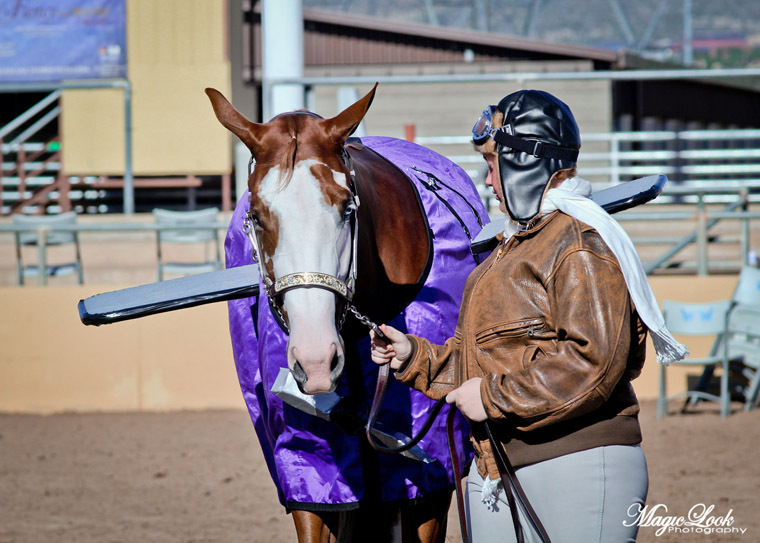 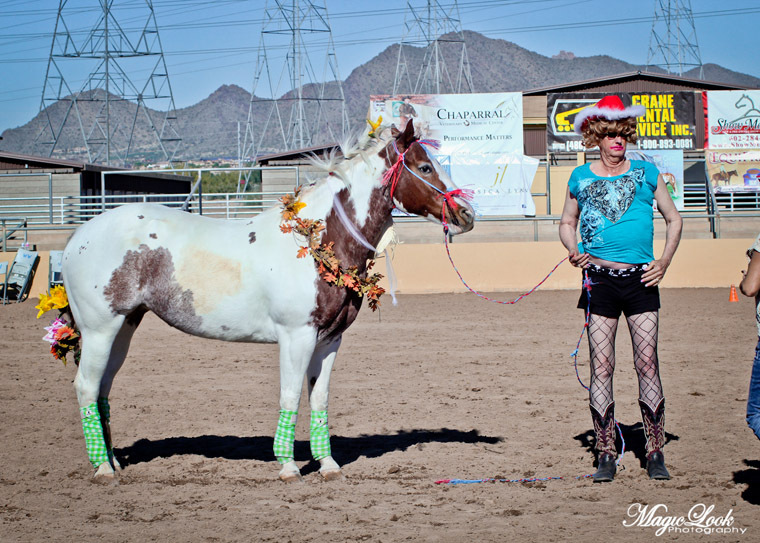 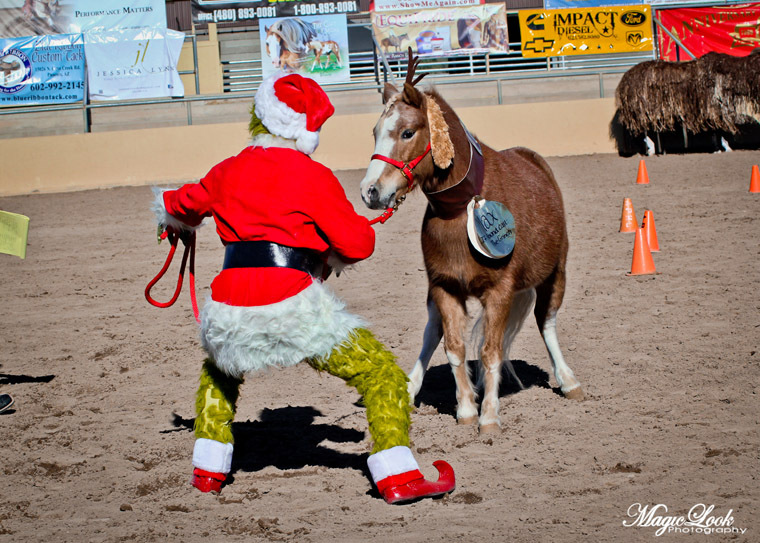 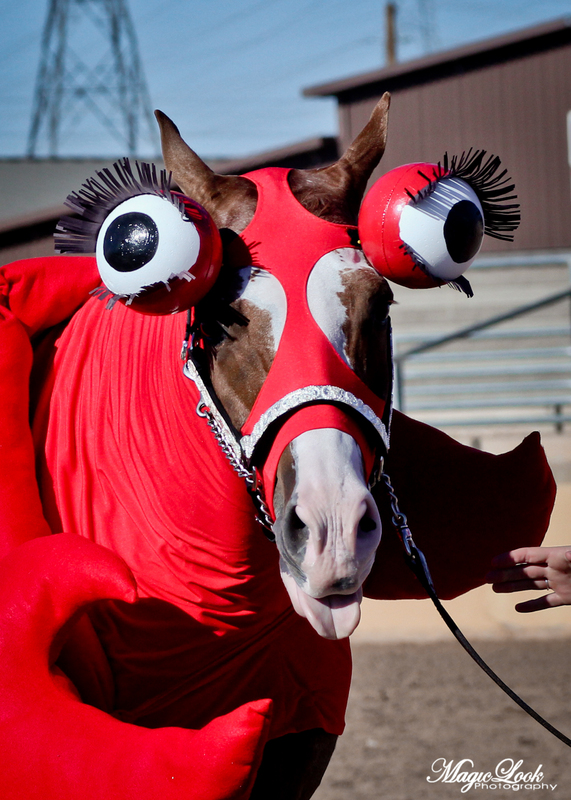 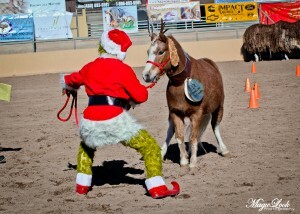 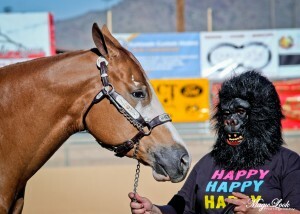 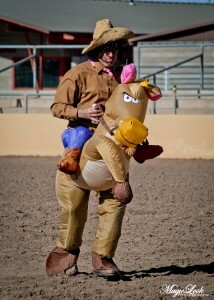 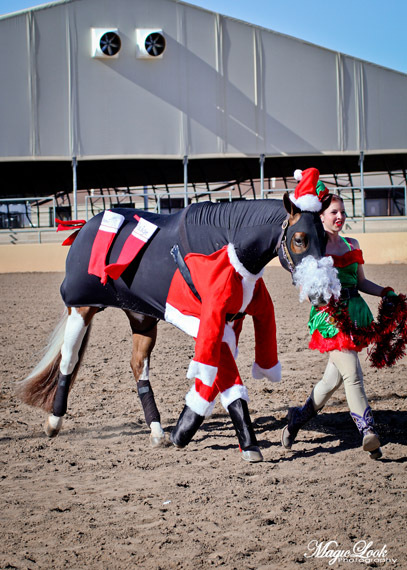 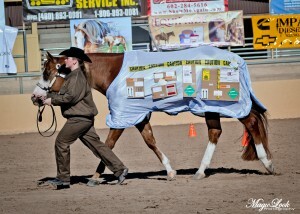 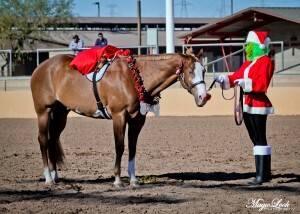 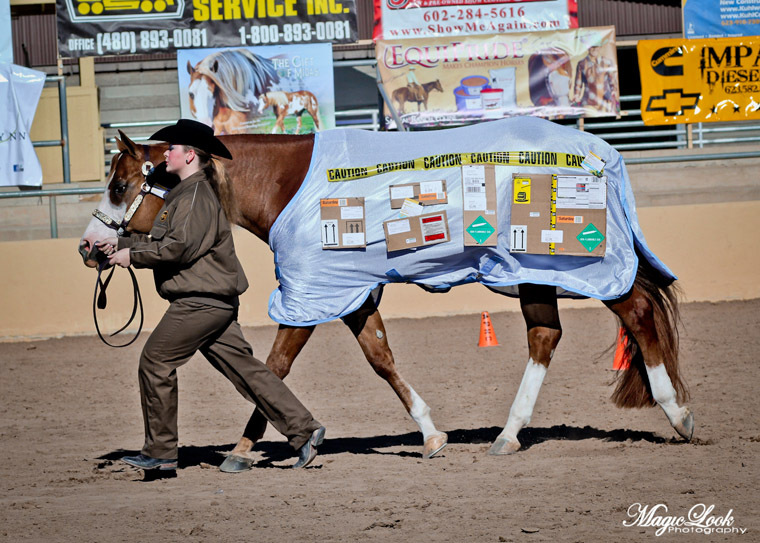 However, at the recent Arizona Copper Country Paint-O-Ramas, all conventions flew out the window and hilarity ensued as 17 horse and handler teams donned their most creative costumes to compete for charity. 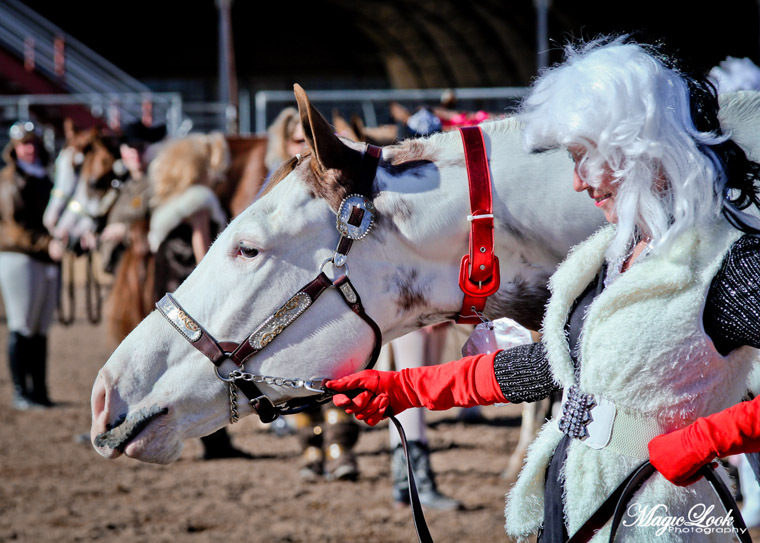 Joining the group was a decadently dressed Cruella de Vil accompanied by her oversize Dalmatian, a flirty Sandy and Danny duo straight out of the movie Grease, the Grinch with his sidekick Max, and several prima ballerinas. 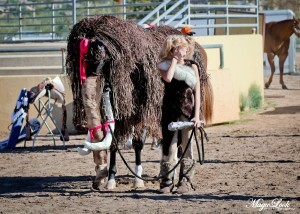 But by far, the crowd favorite was definitely the cave girl with her woolly mammoth. 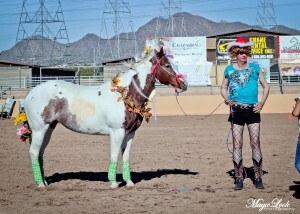 Roden explains that the Freestyle Costume Showmanship class was always a big hit at past Copper Country Paint-O-Rama events. However, when the show was cancelled in 2011 after a successful 30-year run, the Costume class was lost… but not forgotten. 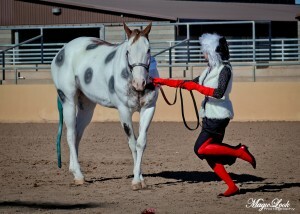 Image courtesy of Magic Look Photography. During the show’s New Year’s Eve celebration and accompanying chili cook-off, each team was auctioned off in a calcutta format. 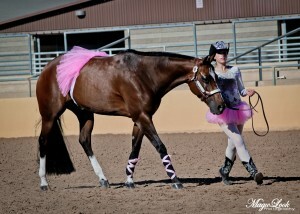 The 17 entries helped to raise $1,066. 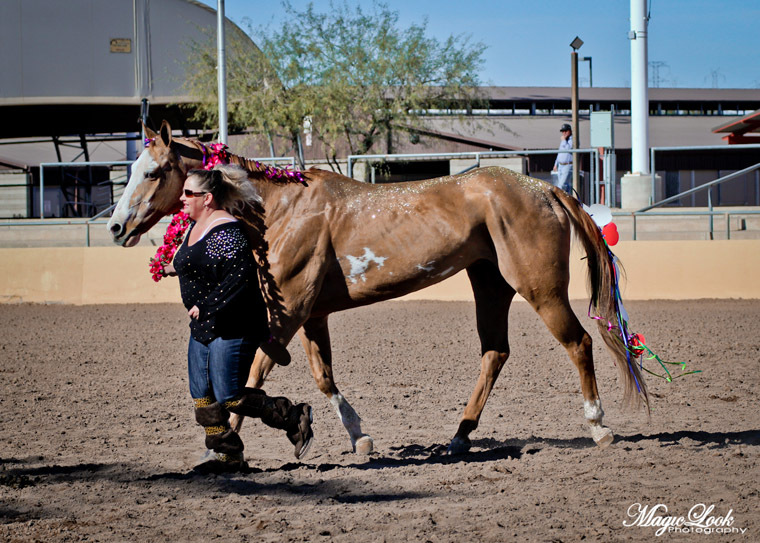 With a 50/50 split $533 was set aside for the class winner and $533 will go to Susan G. Komen of Arizona for breast cancer research. The winners also received rough-out saddles for first place. 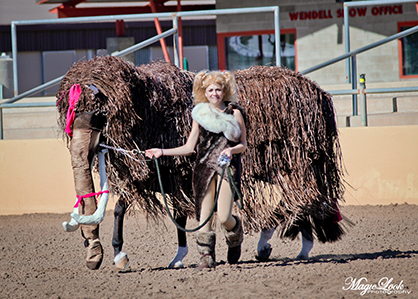 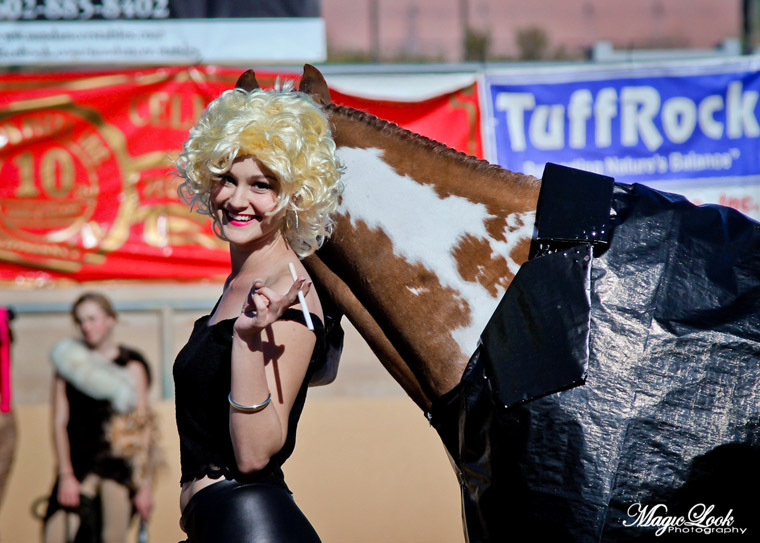 When the actual competition took place on New Year’s Day, the stands were packed as Skylar Smith led “Rodney,” the woolly mammoth, to victory alongside co-champion Callie Wells and “Harley,” the pair that was dressed as Sandy and Danny from the movie Grease. 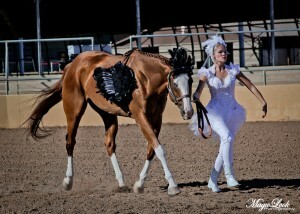 Roden estimates that the show saw 300 stalls reserved for the duration of the five-day event. 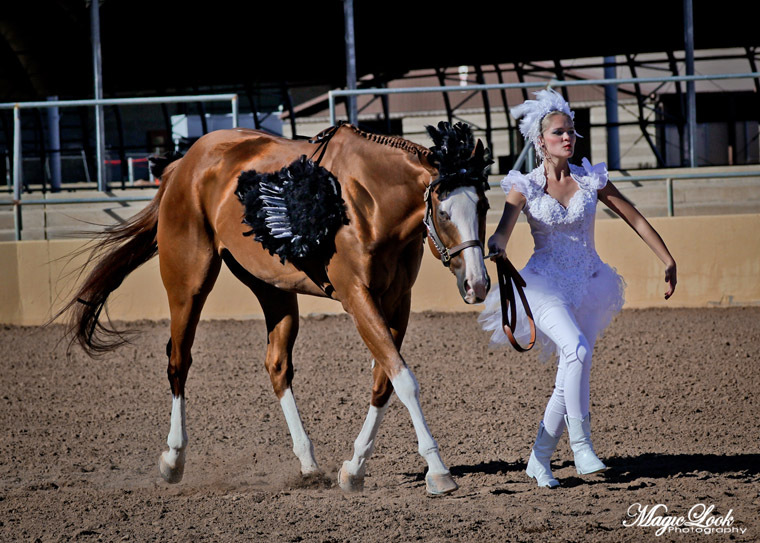 Some of the largest classes included Youth Halter Geldings with 20, Senior Trail with 30, and many full-pointed classes in the Amateur division. 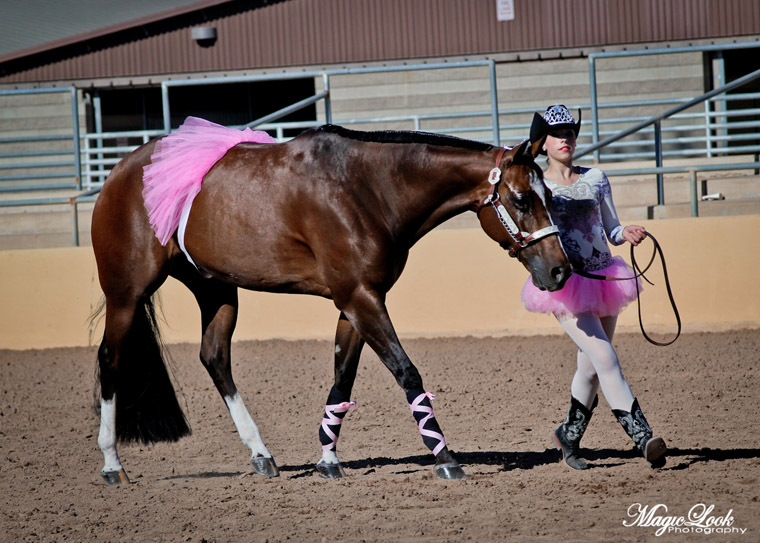 The folks from Magic Look Photography have provided us with a great selection of images from the Freestyle Costume Showmanship class. 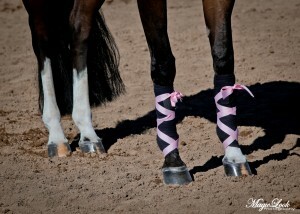 Scroll below to check them out! What’s your favorite costume?